Nio Inc. is a tiny player in the China plug-in electric vehicle (PEV) market. They are considered to be the only real pure-play China PEV manufacturer publicly-listed in the US, which has contributed to its absurd valuation. Nio burns prodigious amounts of cash; while, optically, they appear to have a lot of cash, they probably only have about two quarters' worth or less now. Nio desperately needs to do a large equity offering within the next quarter or so just to stay afloat. While I can see a couple of different paths for how this plays out, the end result is the same: I see the equity likely being worthless. Nio Inc (NIO), a China-based PEV manufacturer*, currently sells one vehicle model, the ES8, a large SUV that retails in China for a starting price of almost $70K. They plan to launch a slightly cheaper model, the ES6, this coming June. If you were curious, NIO's Chinese name means "Blue Sky Coming." Unfortunately for NIO and their shareholders, it's actually dark storm clouds that are coming...and they're coming fast. NIO IPO'd in September 2018 raising $1.1B at $6.26 per share (which was the low end of the $6.25-$8.25 range) and gave them an initial market cap of about $6.6B. While the initial investor interest in the IPO was less than enthusiastic, shares soon caught a post-IPO bid and traded as high as $13.80 within days following the IPO, briefly giving them a valuation of over $14B. I believe that the temporary spike up in shares was based on the relatively small initial float (about 18% of total shares outstanding) and investor excitement about playing the largest PEV market in the world, China. I don't believe this brief spike up had much of anything to do with particularly positive happenings at NIO. And in general, investors haven't started to come to their senses since; the stock has trended down to below $5 now. While it may appear that the short opportunity has been missed, appearances (in this case charts) can be deceiving. NIO is still hugely overvalued and time is currently not on their side. Despite the stock generally being in a steady decline since the early post-IPO pop, at the current $4.75 per share, NIO still sports a sizeable market cap of $5.0B. I believe not only that this valuation is far too high to be justified right now, but more importantly, I believe that the equity could likely end up proving to be worthless, and it may not take that long. I see NIO as a great short opportunity. One thing that you may be wondering at this point, given this article is focused on NIO, is where is NIO on this list? The short answer is that in 2018 they did not have a top 20 PEV model. This is partially due to their low share in the EV market (to be discussed further below) and partially because of the fact that NIO did not start making initial vehicle deliveries of their ES8 model (their sole offering in 2018) until June of 2018. Based on NIO's disclosed 2018 deliveries shown above, they had 1.0% share of the overall PEV market in 2018. This somewhat understates true share in my opinion given the mid-year launch of their first vehicle. So once ramped towards the end of 2018, NIO had about 2% share of the overall China PEV market. This, at best, makes them a relatively minor player in their home market and they have no international sales at this point. Unfortunately for NIO, the story got even worse for them in early 2019. NIO announced that they delivered 3,989 vehicles in Q119, modestly surpassing their original guidance of 3,500-3,800, but still representing a decline of -50% from Q418. While monthly data on overall China PEV deliveries during the month of March is not yet available as of this writing, if we use the delivery data from January/February 2019 and assume the same year-over-year growth rate of 138% for the month of March that was seen YTD through February, we can estimate that the Q119 China PEV market grew to a total size of approximately 293,000 units. Putting this all together would imply NIO market share dropped from about 2.0% in November/December down to about 1.4% in Q119. This is a troubling sign given that Q119 was only their 3rd quarter of vehicle deliveries, making them a relatively new entrant to the PEV market. One would expect (or at least hope) to be seeing steady market share growth, not declines, at this point for a new entrant like NIO. This is a big red flag. The China PEV market is large and growing very rapidly, but NIO is simply not a significant player within the space, as demonstrated by its miniscule market share (which could already be in decline at this point!). China PEV Market: Potential Issues? 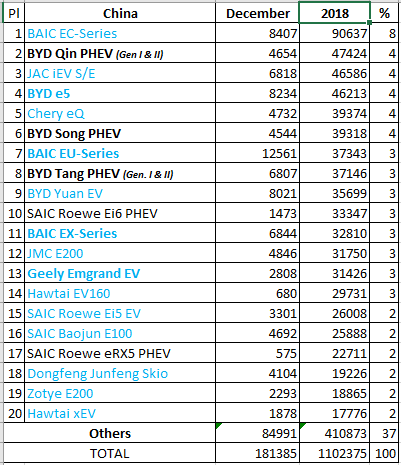 1) The large number of competitors: they note that there "are now 486 EV manufacturers registered in China, more than triple the number from two years ago." Naturally, they expect the vast majority to go out of business. 3) Market growth slowdown: while some believe the China PEV market is heading towards 2M+ units in 2019, which would keep the 80%+ unit growth rate seen in 2018 intact for 2019, Bloomberg analysts are more pessimistic, as they expect sub-50% unit growth (1.6M units in 2019). "Our founder and Chairman, Mr. Bin Li, is an experienced entrepreneur in China with extensive expertise and a proven track record of creating innovative and disruptive business models in the mobility and internet space." NIO had about $1.2B of cash at the end of 2018 (along with $616M of debt) and subsequently raised $750M in a convertible bond offering in February 2019. So together NIO would have nearly $2B of gross cash, which would seem to be a relatively healthy amount, on the surface. The problem is even with what seems to be quite a large amount cash, NIO simply burns through absolutely massive amounts cash on an ongoing basis. In 2018 they burned over $1.5B in cash during the year, which works out to $383M per quarter on average during 2018. Of the $1.5B+ of negative free cash flow in 2018, $1.15B was burned in operations, with the balance being capital expenditures. The cash burn was somewhat lower in 2H18 (once they had started delivering the ES8) than in 1H18 ($230M per quarter burn from operations in 2H18 versus about $345M per quarter in 1H18). One might think that this reduced cash burn was due to vehicle sales (and revenues) ramping up in the second half of the year, but I believe this conclusion to be incorrect. NIO reported a gross margin on vehicle sales in 2H18 of approximately 0%, meaning on the surface the vehicle sales did nothing to add/detract from cash flow in 2H18 versus 1H18. D&A did increase somewhat in 2H18 relative to 1H18, which we could logically conclude is associated with the increased vehicle production as deliveries ramped in 2H18, but it was only about $10M per quarter higher in 2H18 versus 1H18. This doesn't explain the reduced second half cash burn. Instead, I think it's simply working capital timing differences. I believe it's fair to use the full year $1.15B in negative cash from operations as a reasonable run-rate throughout 2018. "so you'll see high expenses in Q1"
"But don't forget ES6 we haven't start - I mean we haven't started the marketing campaign, yet. This is mostly the referrals, word of mouth. So you'll see us in April when the Shanghai Auto Show takes off, as William had mentioned having a lot more marketing on ES6. " 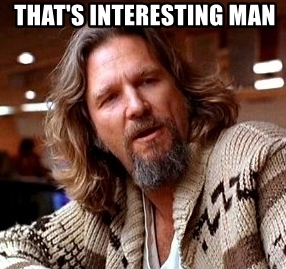 "We already expected that the early stage of ES6 order is not as good as ES8. That's why as Louis mentioned, we will be holding large scale test drive campaigns and the marketing campaigns starting from May"
2) CapEx has been guided to be $600M in 2019, a significant step up from the $385M spent on CapEx in 2018. 3) Q119 deliveries were down 50% from Q418 levels and they stated on their call in March "We expect deliveries in the second quarter 2019 to reflect continue weakness..."
Average cash burn from operations was $288M per quarter ($1.15B for the year) in 2018. All indications are that operating expenses will continue higher in 1H19 based on their commentary. While I won't assume anywhere near the $114M sequential increase we saw in Q418, I will assume they'll spend an extra $50M per quarter in OpEx in 1H19 versus Q418 levels (approximately a 10% increase). This would put quarterly OpEx at around $550M per quarter, or $2.2B for the year. This would be an $840M increase versus 2018 or an increase of $210M per quarter relative to 2018. CapEx will average $150M per quarter in 2019 based on guidance. Deliveries in both Q119 and Q219 will be substantially below 2H18 levels. Given cash gross profit was in the very low single digits % in 2H18 (or possibly zero), we should see some deleverage on the gross profit line, and some increased cash usage due to some inventory build. I'll assume an extra $10M per quarter of burn at the gross profit level due to the big drop in sales in 1H19 (recall deliveries were -50% sequentially in Q119 relative to Q418 when they generated $500M in revenue). Only hitting them for $10M per quarter in gross profit on a likely ~$250M drop in revenue seems generous, if anything. Additionally, I'll assume $50M of inventory build on top of the $213M they carried at YE18, or effectively an additional $25M per quarter of burn due to inventory in 1H19. This implicitly gives them some credit for slowing production somewhat in response to weaker 1H19 Sales. If production remained at late 2018 levels, the burn here would be far higher. So, in adding these up, I'm estimating approximately $680M per quarter of cash burn during 1H19, a staggering amount for a company with just over $5B in market value. Using a starting point of just below $2.0B in gross cash, this means they had fewer than 3 quarters of gross cash at YE18 even after the subsequent $750M convertible bond raise in February 2019. I would estimate that currently in mid-April, they would be down to $1.1B-$1.2B of gross cash and perhaps a net debt position of about ($200M) today. At the current burn rate, they will run out of cash completely sometime in Q319. If one assumes they'd need to keep at least several hundred million dollars on their balance sheet to run the business, I believe they will be effectively out of cash within just about 1 quarter from now! NIO Option #1; Source: "Thelma & Louise"
Cost cuts will naturally be associated with slowing/non-existent growth in the minds of investors (much as it has in the minds of many investors recently with regards to TSLA). Shareholders that own NIO surely doesn't own it for the negative FCF generation! They own it as a way to play the high growth in the world's largest EV market, i.e. put simply, they own NIO for the growth. Anything that damages that perception of growth (like cost cuts) will result in investors dialing back their growth expectations and thus re-assessing the value of the company to be lower. At their scale, even with big OpEx and/or CapEx cuts, given essentially zero cash gross profits, they can't mathematically cut enough to get anywhere near cash flow breakeven obviously, so OpEx/CapEx cuts would at best buy them a few more months, or perhaps a quarter or two. Note that their $600M 2019 CapEx budget was disclosed in the same 20-F filing, so CapEx would have been even higher had they not already taken this step to cut back on their capital spending. I expect similar moves to be made (out of necessity) in the near future. In short, I expect valuation deterioration to continue due to the ongoing large cash burn (even if they start cutting costs) and the collective perception of lower future growth amongst investors. I believe with their continued cash burn and likely current net debt position, further debt financing is off the table and there will be limits as to how much dilution equity investors will be willing to accept, particularly as it's primarily funding ongoing operating losses, not expansion. Whether slowly or quickly, I see a bankruptcy happening the old-fashioned way: they run out of both cash and options to raise more cash. Is there anything else to dislike about Nio here? NIO current sells the ES8 (starting price about $70K), which NIO describes as being their "High-Performance Electric Flagship SUV". They are slated to launch a slightly cheaper model in June of this year called the ES6 (expected price range about $50K-$75K). Here is how they describe the ES6: "ES6 is a high-performance, long-range, smart electric SUV." 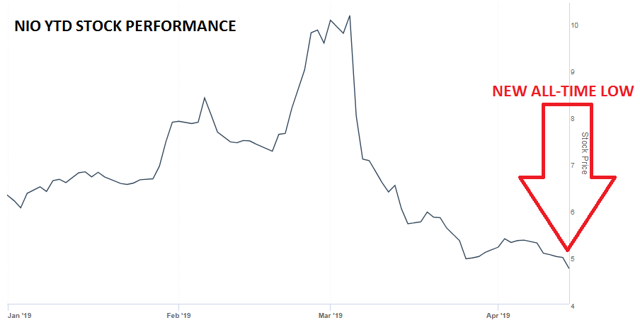 Some bulls out there surely must view the launch of a second lower-priced model from NIO as an upcoming positive catalyst that can drive a positive inflection higher in unit volumes and revenues. I have essentially the exact opposite view. 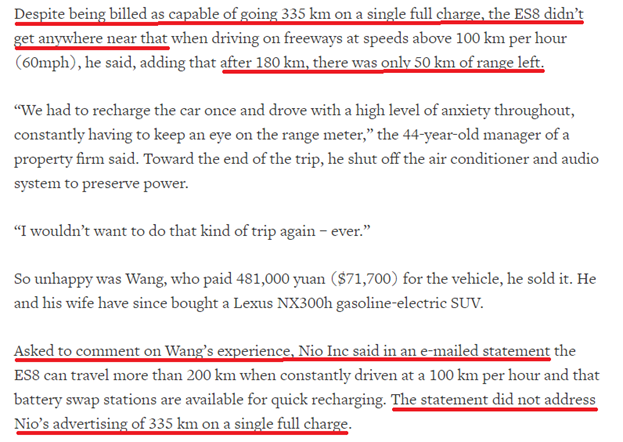 I believe that launching a modestly cheaper "High-Performance Electric SUV" (how NIO literally describes both the ES8 & ES6) as their second model (the ES6) was a disastrous mistake. I believe that the ES6 launch in June could potentially make things even worse than they already are for NIO. They are simply launching what is essentially a similar, modestly lower-priced version of their current ES8 luxury Electric SUV, a model that is already showing signs of substantially weakening demand. ES6 may simply cannibalize one-for-one ES8 sales, thus simply keeping overall delivery levels similar to what they otherwise would have been while reducing revenue (and likely margins)! No, I most certainly do not see the ES6 launch as an upcoming positive event for the company or its investors. Needless to say, NIO is extremely hard to value: what's a perpetual stream of hugely negative cash flows worth? While I don't believe TSLA will actually post positive EPS in 2019, the sell-side consensus does, so given the above data, NIO appears at least somewhat overvalued relative to the EV industry "bellwether" TSLA, should you try to value it on P/E (given NIO's negative expected 2019 earnings). It looks EXTREMELY overvalued when comparing the two companies on the basis of either P/S or on market valuation to total vehicle deliveries in 2H18. I used 2H18, as both companies saw deliveries fall off significantly in Q119, though NIO was much worse (NIO -50%, TSLA -31%). And also because both ramped their now highest volume model in 2H18 (NIO's ES8, TSLA's Model 3), so it felt like a similar enough period for each company that it provided a good timeframe for direct comparison. NIO's stock appears to be approximately 3 times overvalued currently relative to TSLA when comparing their respective valuations to vehicles delivered. So I think what this tells us is that even disregarding NIO's near term liquidity issues, the stock still clearly seems overvalued today. Lastly, I must mention as a postscript to the NIO/TSLA comparison valuation analysis: while I conclude that NIO is overvalued relative to TSLA, I also believe TSLA to itself be significantly overvalued, but that's for another article. Ultimately, however, I see NIO being worth close to zero. The combination of their borderline irrelevance in the PEV market (2% market share or less in China, zero elsewhere) and enormous cash burn will soon cause there to be no value left here for the equity holders. Right now, NIO currently appears based on its most recent balance sheet (Q418) as though it has about $735M of net cash (which happens to represent a healthy 15% of its current market cap). The upcoming Q119 balance sheet will likely show investors the magnitude of the current cash burn; I expect that net cash will have dropped from $735M to close to zero. This should certainly catch investors' attention, as their financial position will now look much more perilous (and more reflective of reality). I expect a large equity raise within the next quarter. Given the burn rate analysis above, they can't wait much longer than about 1 quarter before needing to do a large equity raise that represents in excess of 10% dilution (i.e. $500M+). I expect they will have to price this at a severe discount to the prevailing market price of the stock, so dilution to raise $500M, as an example, could be MUCH greater than 10%. This will only buy them another quarter or so anyway while driving the stock lower in a step-function drop. Running out of both cash and funding options entirely within a few quarters. Game over. Shorting is risky in general, as losses are theoretically unlimited. I advise sizing positions appropriately. The borrow on NIO is not extremely easy (I see it available to borrow at a 4% cost currently), but this should improve soon with what I believe will be a forthcoming large equity deal within the next quarter. NIO is launching a new lower-priced model called the ES6 that is coming out in June, as discussed above. It is expected to be priced at between $50K-$75K. Perhaps the ES6 proves to be a hit and they see big gains in market share, their financials improve as they gain operating leverage from scale, and they are able to pull themselves out of their currently dire situation. I gave my take on this particular risk above under "The ES6 to the Rescue? ES8 vs. ES6" Lastly on this risk factor, a direct management quote, repeated from above: "We already expected that the early stage of ES6 order is not as good as ES8." Tencent (OTCPK:TCEHY) owns 19% of the company. This gives NIO some level of credibility, I suppose, given Tencent's status as a leader in the China tech world. But would Tencent really want to own more than what they already own of NIO? Do they want to own an automaker* outright? Personally, I am a Tencent shareholder and I would be very disappointed to see them go in this direction, nor do I believe they have any interest in doing something like this. Tencent's stake in NIO is equal in value to about 0.2% of Tencent's market cap; this is not even a meaningful bet for them. As mentioned already, the new (less generous) PEV credit program was announced a few weeks ago by the China government. My understanding is that this decision had been awaited (and under review) for some time. The risk is that these subsidy reductions are somehow made less severe or are reversed entirely. My only response to that (given that I can't judge the political risk in China) is that NIO's results were pretty awful under the old (more favorable) system in place in 2018. So, I'll conclude with a question to shareholders of NIO: Do you believe you're one of the lucky 10% of investors that won't see your China PEV investment wiped out? I certainly don't. Disclosure: I am/we are short NIO. I wrote this article myself, and it expresses my own opinions. I am not receiving compensation for it (other than from Seeking Alpha). I have no business relationship with any company whose stock is mentioned in this article. Additional disclosure: Long TCEHY. Short TSLA.